This entry was posted in Awareness Poetry and tagged anxiety, awareness, bipolar, Blogging, depression, emotional, emotions, health, Life, mental health, mind, original writing, personal, poem, poems, poetry, wriing, writing. I hope honesty doesn’t shoot me in the foot later…but….I had to share because I’m not moved to tears very easily. This is a pure, raw, & very emotionally charged piece IMHO Kudos on such a capture…. Been there, Corey. Bang on and well said. I hope loads of other people read it. Knowing you’re not the only one is the biggest help of all. I think it’s very hard to express the feelings of depression. I honestly think it’s the hardest feeling to express in words thoroughly because you get caught up in trying to associate it with something else in hopes that what you say would make someone else understand it too. I want to write as great as you one day. So, please keep up the great work that I have something to look up to. I think writing may be a sad and lonely work. We live a lone we create a lone. Reblogged this on Goth Culture Blog. Great work! Much of my debut poetry collection deals with my own struggles with depression. A very important subject to put to prose. No problem! My poetry collection is entitled ‘Lost Yellow’ by the way. A very deep strong piece! Excellent poem. I hope you are doing okay. If you want to talk I will listen. Beautiful… Sending Love & Light your way. Wow, this is spectacular. Will be re-blogging! Actually sadly it is higher, one in 4, major issue highlighted by World Health Organisation. I have battled/lived with depression most of my marriage so I can identify with your poem. Hope there are good days as well as bad and small things in life that give you slight relief and a breather from the gloom and overwhelming hopelessness. 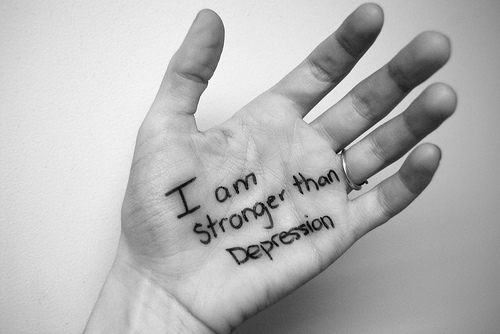 It does get better, however many times or how long your depression lasts. ‘you are in a nightmare’ … nicely put! Great work, and hope you’re fine! It is very spot on. Anyone who experiences depression can relate to what you say. I know I can. Thank you for sharing. This is amazing and it really speaks to me. I love it! God is good indeed ! When I am depresssed….. the Lord lifts me up…. as I seek His face. Yes, you are stronger! Great piece. Thank you for following, I’m following you back. =) I’ll follow you on Twitter as well. Thank you :). You have a brilliant blog! I’m guessing something like this is not easy to write. Well done. It’s an interesting piece to analyse. It’s obviously written from the point of view of experience it… but the choice of language (whether conscious or not – I’m not presuming to know) creates distance… e.g. “alone YOU are not, And YOU will get through it…”. For me – that’s what illustrates the barrier of isolation. I like that, a lot. Your poetry is very moving, most of us can relate. Poetry and music got me out of my own abyss. Glad to know no one is alone. Thanks for visiting NoFi Jazz Cafe. Matthew and Sharon Scott. You have captured the depressed one’s feelings perfectly. Praise God we do not have to stay in a depressed state, we can be lifted out of it by one who is greater than ourselves. Reblogged this on Uncomfortable Conversation. It’s really difficult to explain to people what going through depression is like, even more so to explain it as a male going through it. People easily assume it to be an emotion rather than illness. But you capture it beautifully. Well done! Am so happy to come across your blog. Wonderful writings ! ……..and thanks for liking my work ! the life right out of you. Thanks for the like and the follow. why isn’t there a follow button on your site? I’ve seen this on others. Seems I have to sign up for something on your site. I can only access by responding under my comment section from where you liked or followed. Okay…i clicked on follow once your full site came up. I suffer from crippling depression at times and for me, this poem hits right home. Could not have put into words better myself. I won’t say that its beautiful-depression never is-but it is real, it has girth and I can relate to it. So true. Beautifully written piece of prose about a dreadful illness. I write A LOT about depression on my blog so I am thrilled yo have decided to follow me.Wishing you the best and God bless you in your journey. Been there, still am there, in many ways. Very well put.